BRP introduces the all-new Sea-Doo Spark watercraft designed to make any family’s dream of great days on the water possible right now. The 2014 Sea-Doo Spark watercraft leads an entirely new segment of the Sea-Doo lineup designed for the young family looking for simple and accessible fun in a stylish, compact, and lightweight platform. The Sea-Doo Spark model carries with it BRP’s innovative DNA from the industry-leading Sea-Doo brand. The Sea-Doo Spark model is compact and is the lightest watercraft on the market1 providing a fun and playful ride. It is easy to maneuver, is ideal for short rides on smaller bodies of water and can still be used under rougher conditions by people looking for an exciting or more challenging ride. This model stands out with a stunning new look and comes in a variety of 5 colors and numerous customization options, so everyone can make it their own. The new Sea-Doo Spark model is the most affordable watercraft on the market, costing nearly 40% less than the closest model2 and is the most fuel-efficient watercraft in the industry3. It is economical to operate and maintain, making Sea-Doo ownership accessible to more households. Its compact design and lightweight construction makes it easy to own, easy to tow with many popular compact sedans and simple to store. The Sea-Doo Spark model is powered by the ultra reliable Rotax 900 ACE engine family, the most compact and most economical to run, 4-stroke watercraft engine. The Sea-Doo Spark is part of a leading brand recognized for innovation. BRP’s Sea-Doo design and engineering team developed a new concept for the structure of the vehicle to create the lightest watercraft on the market. Named Exoskel, this minimalist architecture gives the Sea-Doo Spark watercraft an open-air upper deck appearance with a framework that consists of two forward swept “arms” securing the handlebar and rider connection area. The Exoskel minimalistic architecture keeps only the essential structural parts in the rider control area and maintains strength and durability. 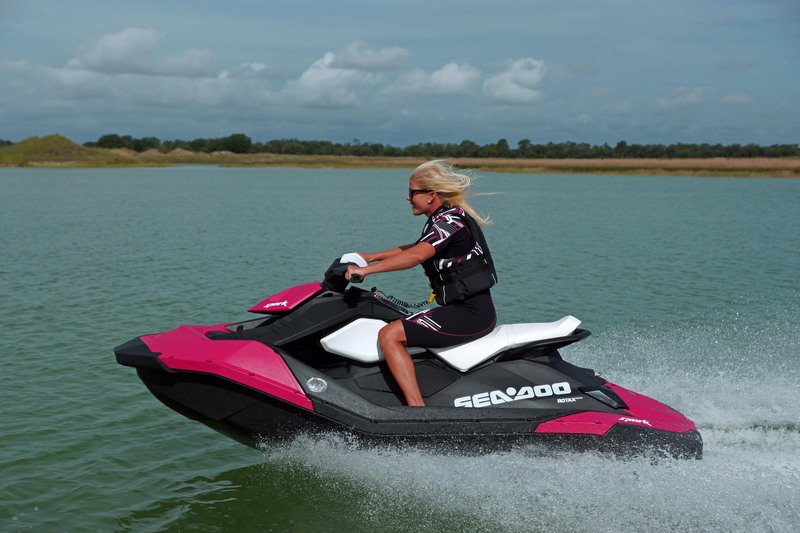 It reduces the weight while creating a modern and cutting-edge design that defines the uniqueness and maneuverability of the Sea-Doo Spark watercraft. The innovation of the Sea-Doo Spark goes beyond the architectural design and extends into the new materials and processes used to create this new watercraft. Over three years of research and development went into developing Polytec, a proprietary recipe of polypropylene and long glass fibers designed specifically for watercraft hull and deck applications. Polytec, is the “skin” of the Sea-Doo Spark Exoskel providing structural integrity. This material is a recyclable, low density, high-impact resistant, lightweight composite material. Polytec further lowers the overall weight of the watercraft without compromising strength and durability, as has been proven through rigorous, heavy use testing in both fresh and salt water environments including real world ocean impact and specialized crane drop testing. Powering the innovative Sea-Doo Spark model is a new engine, the ROTAX 900 ACE, the most compact marine family of engines currently in the watercraft market. Designed specifically for delivering years of reliable fun, the ROTAX 900 ACE is an in-line three-cylinder 4-stroke power plant featuring iTC (intelligent Throttle Control) system and CLCS (Closed-Loop Cooling System). Because the Sea-Doo Spark watercraft is so light, its power-to-weight ratio is close to 50% better than the closest competitive model,4 making it big in terms of fun factor. ACE stands for Advanced Combustion Efficiency technology and it minimizes mechanical friction at the same time that it improves thermodynamic efficiency for optimal engine performance. This technology combined with the lightweight of the Sea-Doo Spark model allows it to become the most fuel-efficient watercraft available3, with a fuel consumption that’s less than 2 gallons5 per hour. Finally, the Rotax 900 ACE engine is also environmentally friendly. In fact, emissions for the Sea-Doo Spark are close to 13 times lower than similar models from the 90s and early 2000s6 while delivering the same pleasure and responsiveness. In 6 easy steps, riders can personalize everything according to their necessities, personality, lifestyle and budget. From number of passengers, engine size, technology features such as Intelligent Brake and Reverse (iBR) system or the Spark-exclusive Convenience Package to colour and accessories. Full details are available at www.sea-doo.com. 2014 Sea-Doo Spark 2up: the 2up option provides a capacity for two riders with a maximum weight capacity of 350 lbs. 2014 Sea-Doo Spark 3up: the 3up option is ideal for 2 adults and a child or teenager with a maximum weight capacity of 450 lbs. It has an elongated seat and platform extension at the back. This added length provides more buoyancy and stability, plus towing capabilities as it provides seating for a spotter or a second passenger. 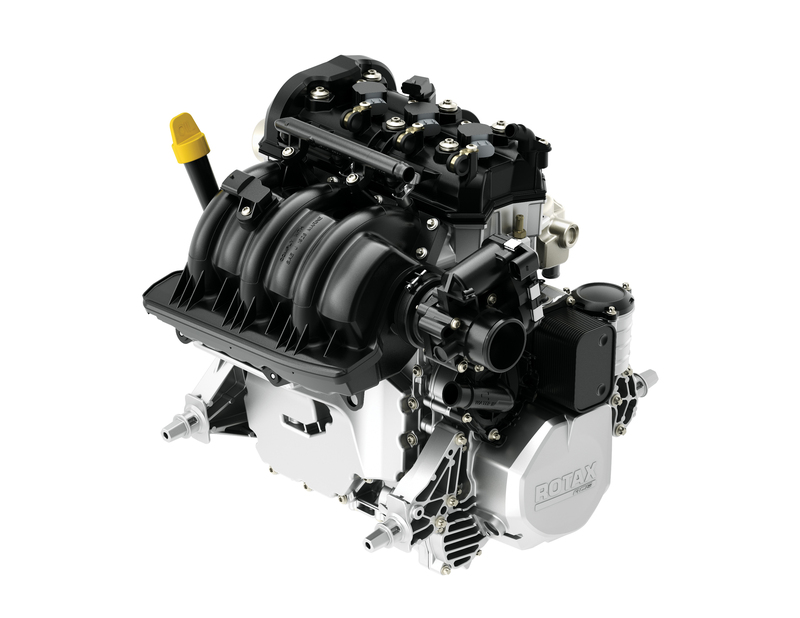 Rotax 900 ACE7– the most fuel-efficient engine on the market. It uses just 1.94 gallons8 of fuel per hour. This engine generates entry-level power and a top speed of 40 mph9 and is only available on the Sea-Doo Spark 2up model. Rotax 900 HO ACE – a more powerful high-output engine with better acceleration and higher top speed that still uses only up to 2.4 gallons8 per hour of use. This engine adds power, Sport mode and has a top speed close to 50 mph9. This engine is available on both 2up and 3up models. The Sea-Doo Spark watercraft is also available with the exclusive Intelligent Brake and Reverse (iBR) system, which gives riders the ability to stop up to 100 feet sooner than other watercraft10, and provides a level of control and peace of mind that has become associated with modern Sea-Doo watercraft. Sea-Doo’s exclusive iBR system provides added maneuverability and effortless docking that can be a great addition, especially for newcomers to the sport. Sea-Doo’s Convenience Package includes popular optional items for Sea-Doo watercraft: a Front Storage Bin Kit to store your personal belonging, plus a Sea-Doo Step for easy reboarding. Riders can choose from Vanilla, Orange Crush, Bubble Gum, Pineapple or Licorice colorations to personalize their Sea-Doo Spark model. Consumers can decide to select fully integrated accessories and one of our 20 Attitude Graphic Kits that will make their Sea-Doo Spark watercraft unique to them. It’s a unique customization nobody else offers. A lineup of Sea-Doo Spark clothing is also available. Chill Shade: this innovative shade provides versatile protection from the sun whether parked at a favourite island or underway. Sea-Doo Step and Front Storage Bin Kit can also be bought separately as accessories. Manual Reverse Kit: left side-mounted lever that makes it easy to engage in reverse. (”Late intro” accessory available for consumers in February 2014). Side Protectors: to protect new Sea-Doo Spark model, the 3-piece rubber formed protector is specifically designed for the Sea-Doo Spark watercraft. Snap-In Fenders: these fenders offer extra protection when docking and can be quickly attached to front and read pre-moulded holes. Sea-Doo Spark Move II trailer has been specially designed for two Sea-Doo Spark watercraft. This double trailer is 25% shorter and 30% lighter than other Move II trailers; so even loaded it can be towed by most common sedans. The Spark watercraft carries the Sea-Doo DNA while wearing it in an entirely new Exoskel architecture and Polytec material providing a stunning new look and ability for consumers to “make it their own.“ The Sea-Doo Spark model is the most accessible watercraft in the industry being close to 40% less expensive than the closest model2, the most fuel-efficient3, and easy to tow and to store. But most of all, the all-new Sea-Doo Spark watercraft is compact and lightweight and an absolute blast to ride. From recreational riding, to performance, to luxury or tow sports, BRP has a Sea-Doo model specially designed for every type of rider. The full lineup of Sea-Doo watercraft provide avant-garde styling, precise, superior handling and great value – delivering many years of fun for the best on-water experience your family can dream of.